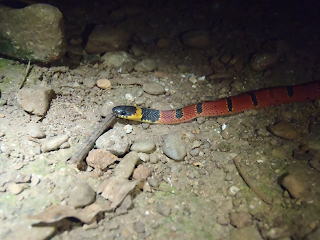 The redback coffee snake is a small, harmless colubrid found from central Mexico to Panama. 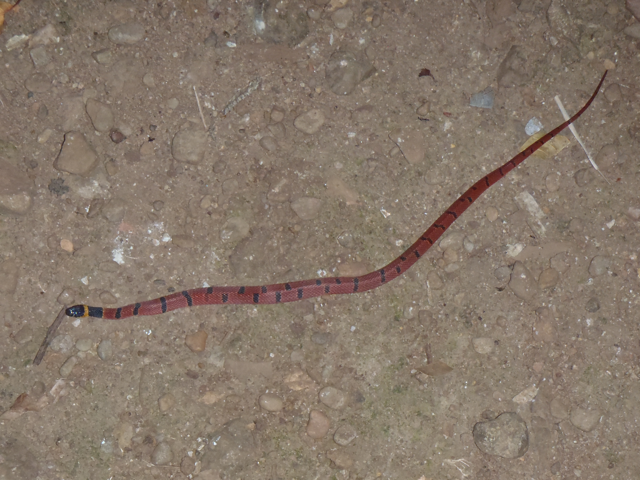 It is an example of Batesian mimicry, as its patterns resemble those of poisonous species, such as the coral snakes in the genus Micrurus. There are 5 species of Micrurus in the state of Veracruz. 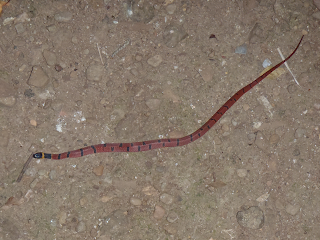 and 14 species of colubrids that mimic them (Torre Loranca et al. 2006). My spanish isn't quite good enough to read the details of that paper, but The Reptile Database page suggests that N. sebae mimics M. bernardi, M. diastema and M. limbatus, and a quick image search does turn up some similar looking snakes. Harry W. Greene (1975) collected 19 N. sebae in an afternoon, searching in a field just east of Lake Catemaco, bordered on one side by rainforest, and a further three specimens under logs in the rainforest. I found my specimen outside the composting toilet at the hostel I was staying at. Greene (1975) describes the stomachs of his specimens as containing slugs, snails and earthworms, as well as dirt and other detritus, while other authors have recorded insect larvae and caecilians in their diet. Females usually lay 2-4 eggs at a time, and nests or gravid females have been found between March and September (Stuart 1948, Burger & Werler 1954, Greene 1975). Females collected by Greene laid eggs in late August and early September, and those that survived hatched after 76 days. When threatened, N. sebae flatten their body dorsoventrally, and raise the anterior portion of their body vertically. This is a instinctive behaviour, and is even exhibited by newly hatched snakes, though with less finesse than an adult (Greene 1975). The snake will also adjust its position so that the red and black pattern on the dorsal surface remains facing at the threat. If handled it will thrash around and discharge it's cloacal contents. When I encountered it, it remained very still while my headlamp was shining on it, and moved when it was in darkness. In the video above I take my light off it briefly, expecting it to be in a new position but remaining still when I pointed it back, but I was surprised to find it making a beeline for my feet. At that point I didn't know if it was one of the venomous species that it mimics, so after taking a short video, I let it return into the night. 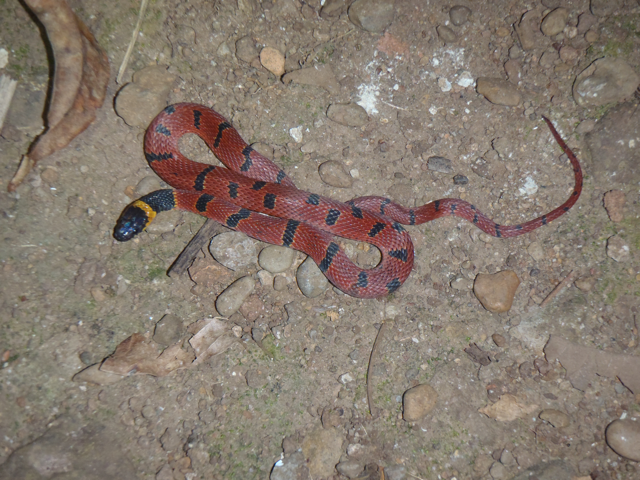 For an overview of the colubrid snakes, and a look at some of the more obscure members of the group, see these two posts by Darren Naish of Tetrapod Zoology.